A novel multistep process can fabricate single crystal, atomically thin films of tungsten diselenide across large-area sapphire substrates. A novel laser-based method can measure stresses and strains in a 2D material, allowing scientists to probe their effect on the material's properties. A thin film made from iron, cobalt and manganese may have a magnetization density that is 50% greater than a previously considered maximum limit. Researchers have come up with a new titanium-based material for making lead-free, inorganic perovskite solar cells. Cheaper and more environmentally friendly solar cells with new perovskite material. Micron-sized spheres coming together under the influence of a spinning magnetic field can be used to model 2D materials and other molecular systems. Scientists have uncovered evidence of rotating vibrations known as chiral phonons in a 2D material, which could be used for new forms of computing. 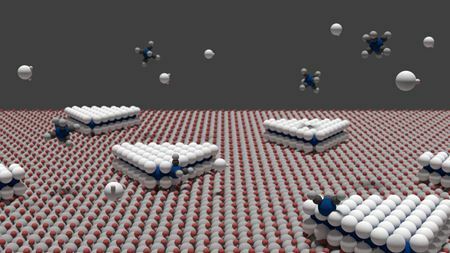 Scientists have synthesized a novel form of titanium nitride, called titanic nitride, which has promising mechanical and optoelectronic properties. 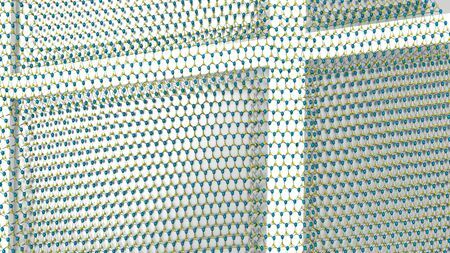 Engineers have created a method for systematically designing metamaterials using the principles of quantum mechanics. Lining up gold or silver nanocubes in edge-to-edge configuration improves sensitivity performance in molecular sensing.